Is there such a thing as legible identity privilege? This thought was tumbling around a lot in my mind for a while, particularly in discussions of what it means to be femme and presumed as female, but also when cis folks would ask me about assuming pronouns when you’re “pretty sure you know” someone’s gender versus when it’s unclear. As a starter, I’ll say that if there is a legible identity privilege, it’s certainly not anything like as strong as other privileges such as being white. As a white non-binary person, I am less vulnerable to violence and harassment than any black or brown person, full stop. I explicitly reject any arguments that white non-binary people make around “binarism” putting them in a riskier place than a black trans woman, for example. See b. binaohan for why that’s fucked up. But considering this as its own possible thing, I have a few thoughts. One is that, like “passing privilege,” this has a lot to do with specific cultural context and how other people perceive you. The two are also related. A trans man who is presumed to be a cis man might experience “passing privilege” alongside legible identity privilege, because he “passes” for a cis man and also “man” is a legible identity. Conversely, a trans woman who doesn’t conform to particular beauty standards and expectations might not “pass” for a cis woman, but could have a legible identity in cultural context–it is clear to most people around her that she intends to be read as a woman, and she is a woman. Gender is pretty abstract. It’s more of a decision to group oneself in a certain way than a concrete provable fact. This is a problem. Since we need a requirement to access medical care, masculinity or femininity might as well be the requirement. It’s easiest to quantify your gender in medical terms if you present as masculine or feminine. Femme trans boys and butch trans girls are just confusing. Don’t even get us started on those genderqueers–especially those who aren’t interested in a more androgynous. What do they even want? What kind of dysphoria could they possibly be experiencing? There is very little to be sympathetic to, here. Now I know there are empathetic medical professionals, professionals who understand the difference between identity and expression, and those who don’t think of trans people as requiring a certain level of tragedy and pity to medically transition. But sometimes, it feels like the profession is stacked against us. Fact: this blogging thing never does get easier. I keep hoping that consistent posting will one day become natural, that I’ll be able to write and schedule posts every weekend, but that is just not a thing. I’m being honest with myself about emotional and mental labor, and the fact that this world we live in doesn’t give us enough time to heal and just be present outside of our paid working hours. I’m also realizing that as an ADD adult, my attention span will never stick with a particular project for more than a month or two, and that’s okay. This blog isn’t going anywhere, though. I have a post scheduled for this coming week, in fact, about a really fantastic book I want you to read. I’m just acknowledging that I’ll probably never follow the best practices of posting regularly and self-promoting, that there will be spurts of activity and then months-long gaps as there have always been. But I’ve also been blogging for more than ten years in some form, so I think that’s likely to stay. There’s another fact in here, which is that I’m not totally comfortable being “a voice” in activist spaces when we don’t as a community acknowledge the labor of people of color who are doing most of the work here. I recently wrestled with the question of whether to write a book about non-binary gender and ultimately decided that I am not the person to write that book right now–because I don’t have the time and energy to do a full, comprehensive survey of non-binary people, focused on the voices of people of color, and the world just doesn’t need a white centered 101 to non-binary identity. I also think that if I do write that book in the future, I likely can’t in good conscience do it without a co-author of color. Since I don’t have collaboration/social spoons right now, I’m instead stepping back. If you’re hungry for queer voices, I recommend you start with checking out black girl dangerous and proceed from there. I finally got my iPhone to successfully play Invisibilia, a much-lauded new podcast from the producers of This American Life. Overall, I really like the show, but I was disappointed and even a bit disturbed by the story in “The Power of Categories” focusing on Paige, a bi-gender person. It’s hard to put a finger on exactly why I feel this way. The hosts cover Paige’s story sympathetically, and seem to have done their research. It’s for the most part a scientific take on the topic. But maybe that’s why, as a genderfluid, genderqueer, non-binary person who can’t quite even pick one word to describe my gender, it rankled me. When the folks at Facebook reached out a few months ago to ask me to create one of the first handful of rooms on their new smartphone-based social platform, called Rooms, I immediately wondered if this might be a better way to implement the vision we started working toward with #transchat on Twitter. 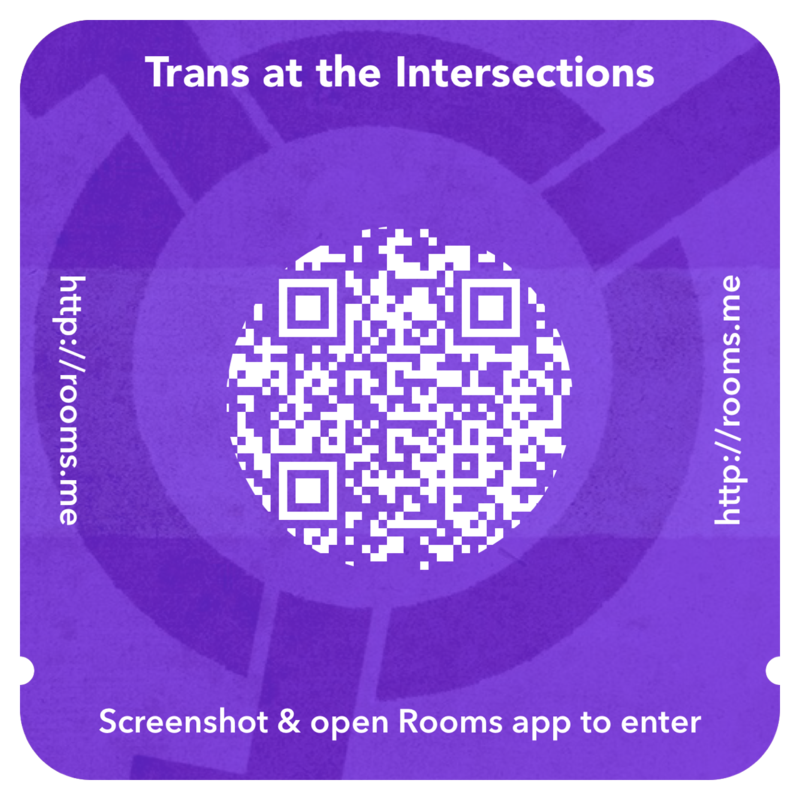 Today I’m excited to announce the debut of a Room called Trans at the Intersections, which you can join by using the image in this post within the Rooms app. Facebook says, “Rooms lets you create places for the things that you’re into,” and I think it’s pretty cool that one of the first Rooms will be an explicitly anti-racist, radical space where trans people can get past the 101 and talk amongst ourselves about our lives at the intersection of trans and other identities. I hope this will be a space for talking about racism in Trans communities, discussing trans feminisms, sharing ideas about sexuality outside the binary, and other topics we think about from day to day. You don’t have to identify with the word “trans” to join, since that umbrella term itself can be problematic, but members should somehow identify as outside the compulsory white mainstream gender system whether trans, non-conforming, non-binary, or something else entirely. The potential of this platform is something like what many of us fondly remember from 90s message boards–you can choose any pseudonym to identify yourself in the Room, and thus don’t have to come out outside this Room. Unlike Twitter, this is a curated space, meaning that any derailing, racist, and/or transmisogyny will not be tolerated, and members engaging in this bad behavior can be banned. I’ll be actively seeking curators in the coming weeks. For now, come join the discussion! You can download the app at rooms.me/download, and then just use the image in this post to join the Room.